For the last few years, I have taught both English learners and teachers through my online lessons and courses. It all got started in 2011 when I offered one-to-one language lessons online. Since then, I have built two brands and focus on selling my interactive programs. Do you want to become an online English teacher working with dedicated learners on a one-to-one basis? Or maybe by offering other products or services? Do you want to decide who to teach, what to teach, and how much to charge? Do you want to be able to teach from anywhere in the world, setting your own schedule? Do you want your teaching to lead to other opportunities in the future? If so, I have the perfect course for you. The Teach English Online Course is a step-by-step video course that shows you how you can become a successful online English teacher. It shows you how you can offer high-quality lessons no matter your subject, work with learners who you want to work with, and earn a decent income through helping others. As you know, online learning is exploding right now, and there are so many opportunities for the teacher who wants to make a difference to succeed. Contrary to what most people believe, you can earn more by going online. This is because you become specialized in one area of your subject, target any learning market in the world, and charge according to the value you give (I’ll show you exactly how to do this inside the course). Starting your own online English teaching business will give you control; control over who you teach, when you teach, what you teach, what you charge, and where you live. Doing your own thing and teaching your own learners is incredibly liberating and rewarding. And if you do this right, you’ll also be rewarded in other ways. Does all of this sound exciting to you? If so, read on to find out more about what’s inside this course and how you can get started. Or click here to choose your package and get instant access. The problem I see with many English teachers or English teachers to be is that they soon run out of opportunities. They realize that the ELT industry isn’t the place to be to keep progressing. It is a course that looks at every aspect of starting your own teaching business, created by an online teacher, web designer, and online marketer (more about me later). And it shows you how to maximize your earnings. The course is membership-based, and upon registering, you will get your own login details access (this includes all future updates and additions to the course). My story of how I created a successful online English teaching business with no prior knowledge of teaching or marketing. Why moving online will remove barriers to your earning potential (yes, you can earn MORE online!). The number one mistake new teachers make, how to avoid this while also standing out on busy platforms. The right mentality to have in relation to your competition (hint: there isn’t any competition). What to expect when you first get started, and how to make a successful transition (part-time vs full-time). The perfect visual that shows you the key to getting new learners… this will change the way you approach getting paying students. Just offer general lessons to everybody, right? Wrong! You will learn why it’s important to find your own niche (easier than you think). I have the perfect example that will show you how specific you need to get with your teaching and what you offer. The magic formula that will bring you success (this includes a worksheet to help you along with this). TWO videos and more resources on how to choose an English teaching niche that will bring in high paying learners. Learn what to include in your lessons to maximize the value you offer and, therefore, your income. What tools and resources do I need to teach? It’s all covered here, including many things you probably haven’t thought about that are super important. 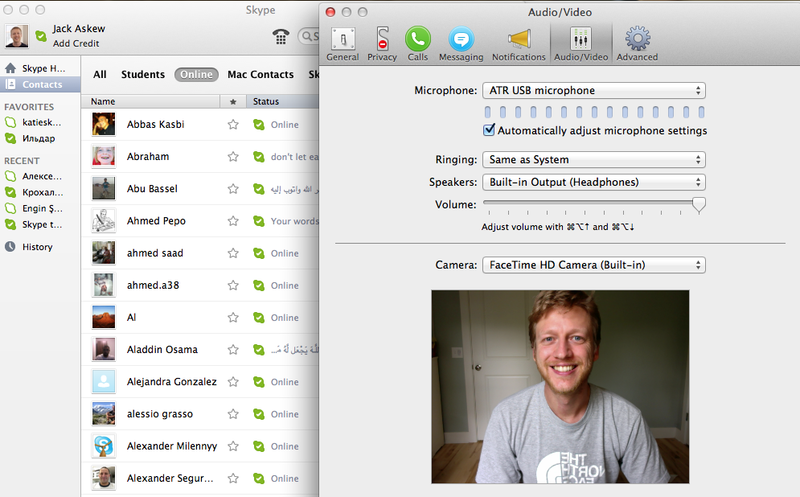 Use Skype, right? Well, it’s not that simple. There are other platforms that offer MUCH more. How much should you charge? Get some solid numbers and advice that’s going to get you VERY excited about your earning potential. Here’s what to include in your cancellation policy… and how to enforce it in a way that limits refunds in a fair way. Should you start a business? I have a great answer to that along with resources you might need. You might be thinking that you don’t need a website. Think again. 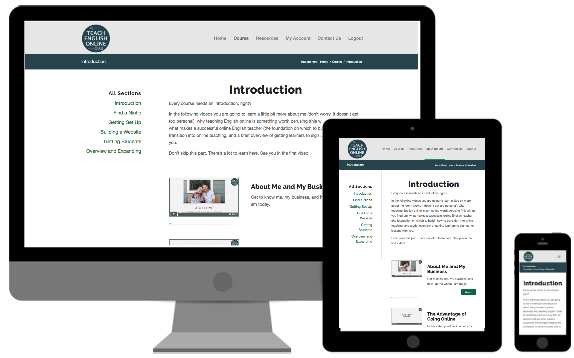 I talk through why a website is so important and the best way to see its overall role in your teaching business. Learn what you should call your teaching business and avoid the BIG mistakes when buying your domain name. Should you design your site yourself or get someone to do it for you? I lay out five different options (I don’t want you to pay more money than you should!). I know how to create websites that convert visitors into paying students. And I pass on this knowledge by telling you exactly what you need to include and where. There’s one page that is the most important to your success. Most people leave this out (but you won’t after watching the last video in this section). Learn how to get students right now with four different methods that work (don’t wait to do this, start filling up your schedule today). There’s a quick-start guide to advertising on the platforms that work. The ROI can be INCREDIBLE if you apply my methods. The best place to create content is… learn exactly where you should be creating materials to attract more learners. Want to bring in lots of free visitors through the search engines? Learn how to do this from an SEO expert. Should I use Youtube? Should I promote my blog? Well, you’re going to find out! Most teachers ignore the number one way to fill their schedule. Learn this technique and how to do it effectively. Most teachers also ignore the number one way to build for the future and build an audience (hint: it’s not Facebook). 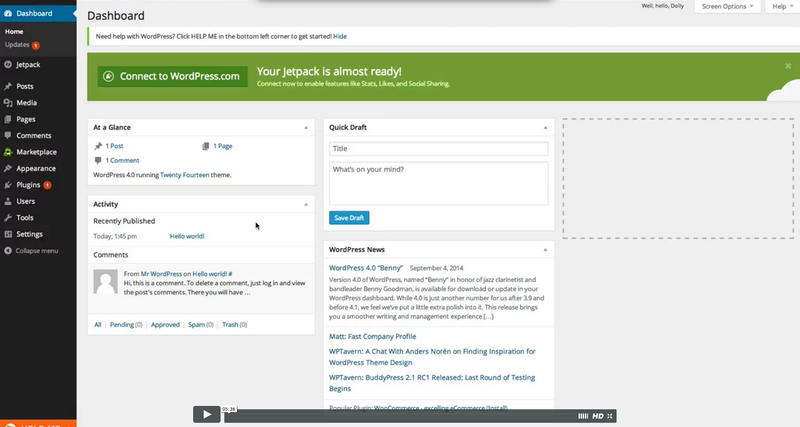 A video and resource guide shows you how to set this up quickly. Follow my technique for trial lessons to ensure that you’re converting potential students into paying students. Build for the future by implementing the different ways to bring in money through teaching online (it’s not just about one-to-one teaching). How to set up group lessons that sell, and what platform is best for this. Learn what products you can sell directly from your website, and how you can do this with ZERO knowledge of coding. The quickest way to earn more from your students once you start getting booked up. An overview of the course and my best advice about becoming a successful teacher. You are going to save hours of time researching and experimenting what works, and the Teach English Online Course will fast-track you into having a full schedule. It’s put together so that you know all the options available to you, and so that you can make the right decisions based on your situation. Whether you are looking to teach part-time or full-time, by the end of the course you will know exactly what you need to do to move forward and become a successful online English teacher (imagine what it’s like to have a full schedule of dedicated online English learners paying for the value you offer). Running throughout the course are certain themes, and this ensures that you have the right mentality and approach your exciting new adventure in the right way. And everything that you can think of (and more) is covered. In total, you will get access to 101 professional video lessons. Each lesson is focused, full of valuable information, and actionable. There are certain themes running throughout the course, and it all comes together in a way that will inspire and educate you so that can fill up your schedule as quickly as possible and set yourself up for the long-term. Under each video, you will find a lesson summary. This helps you digest the information that you have just seen in the video, and also makes it much easier when referencing back to lessons at a future date. 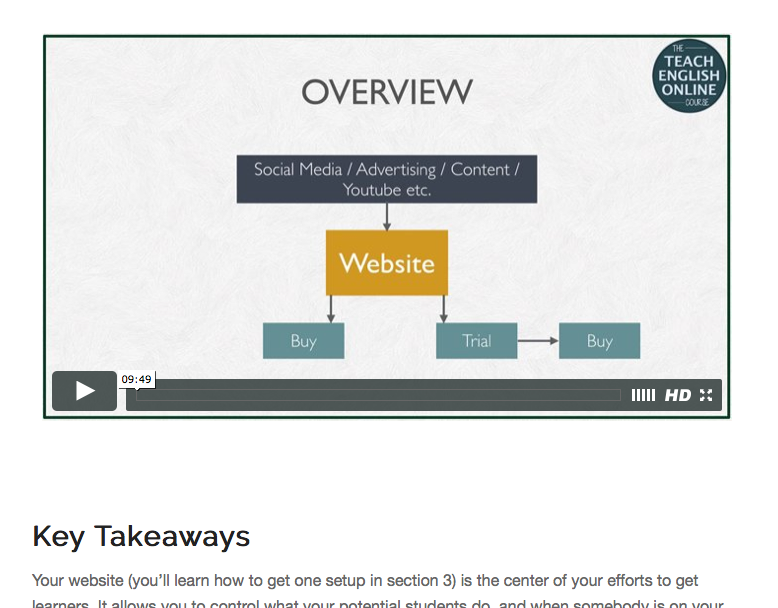 Additionally, a lot of the videos come with extra resources and links. When you sign up for this course (paying a one-time fee), your membership to the course won’t expire as long as it’s around. And as the course is expanded, with extra resource videos and features added, you’ll have access to these too. Take this course everywhere with you. As there are no time restrictions on this course, you can learn at your own pace. It works perfectly on your desktop, laptop, tablet, or smartphone. As an optional extra, you can work with me on a one-to-one basis. This includes a 30-minute phone consultation and a month of Google Docs collaboration. This is where you can ask me questions, get me to take a look at your website, help you with your niche, or whatever you need help with. There is also something called the “TEOC Roadmap” that will help you set goals, create a plan, and point you in the right direction of the course and community. 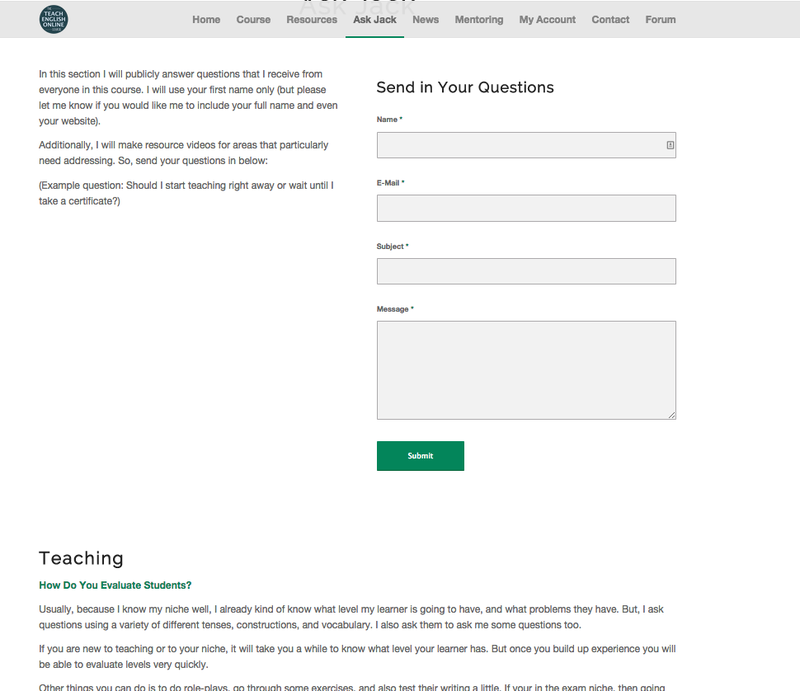 Once you join, you will also get access to the every developing FAQ section that tackle all areas of online teaching. Don’t see your question answered? Just ask me using the form. All TEOC members get access to the secret community on Facebook. This is where teachers come together and support each other on their journey to becoming a successful online English teacher. Share your successes, failures, and get advice from others. This is priceless. 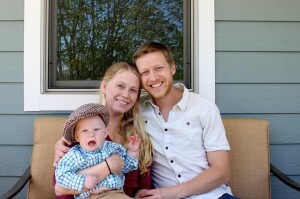 Me with my wife and son, Thomas. Hello, I’m Jack. I have been teaching English learners and teachers since 2011. I have helped many teachers through my blog and mentoring programs build successful online teaching businesses. I created this course because this is the best way that I can help teachers like you succeed in changing lives and showing you how you can maximize your earning potential. 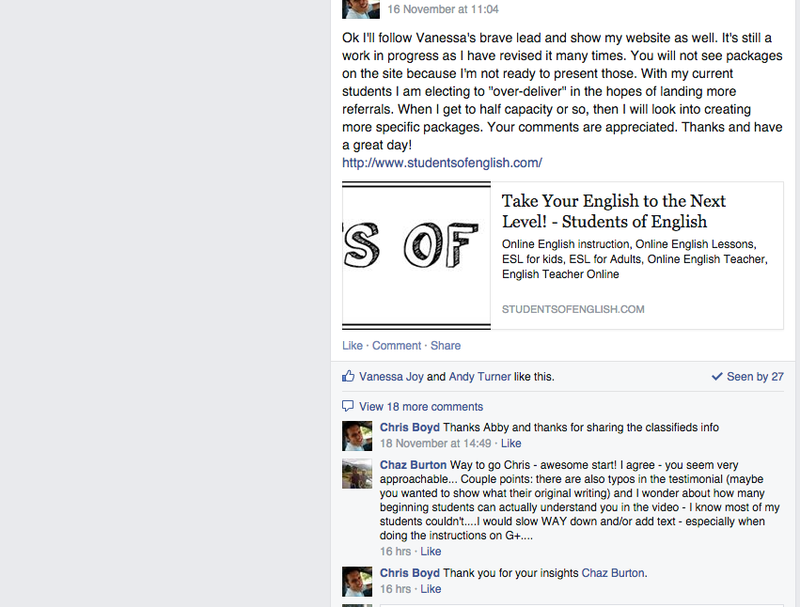 I LOVE to see other English teachers succeed online. All my knowledge and experience of starting up a successful online teaching business is here in this course. I’m super proud of it and know just how valuable it is to have all this information presented in this way. Want to See What It’s Like Inside? Watch this quick one minute video to see what the course is like once you register. Do you want to teach from anywhere, have control over who, when, and what you teach, remove any limits to your earning potential, and make a difference? If so, then this course is for you. There is a BIG lack of online English teachers. As more people move online with their learning, there needs to be specialist and general teachers to fill this void. In fact, this course will show you how to connect with other teachers: after all, all ships rise in a high tide. Is it a good time to move online? It’s the perfect time. English learners are moving online and looking for high-value lessons. Online tutoring is only going to keep growing. There are 6 sections with a total of 45 video lessons all professionally made (resource videos to be made on the basis of feedback). Under each video is a brief summary of the lesson, and additionally most videos have further resources. There are nine extra tutorials that dive deeper into what you’ll learn. You can take the lessons on your own time. How long do I have access for? There is no time limit on accessing the course materials. This includes all new videos, updates, resources, and anything else that gets added in the future. Should I watch it all at once? I especially recommend watching at least 2 or 3 sections before getting started, but you can most definitely go through the entire course; there might be sections that you won’t need at first, but will need at a later date. Can I watch the course on my mobile? The Teach English Online Course can be watched on any device as long as you have internet access. No. It might help in some places, but this course is for anyone wanting to teach English online. 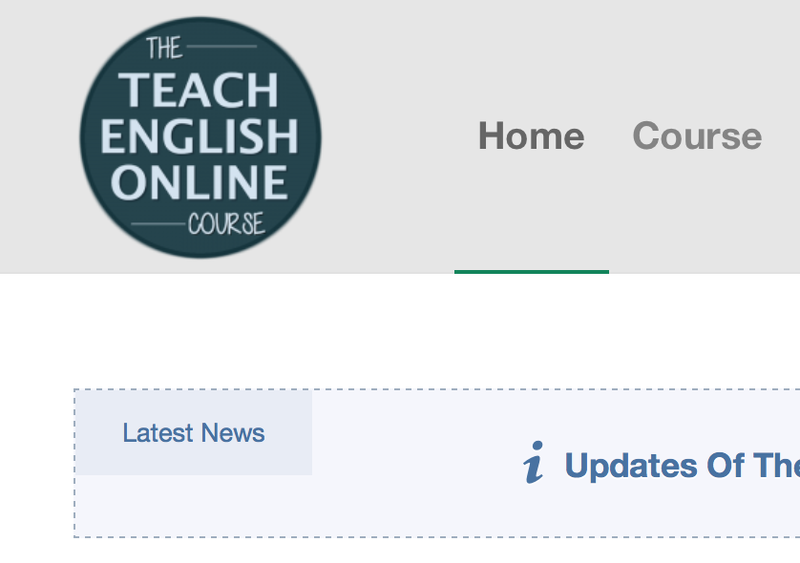 There will be information and extra resources for you if you haven’t taught English before. Will this course show me how to get learners? That is the focus of the course. It shows you, step-by-step. how to fill your schedule with paying students. I’m terrible at marketing. Will you help me in this area? Definitely. I show you what techniques work without confusing you with too much jargon. Everything is related to getting learners into your lessons. All you need to do is follow the different methods and techniques and learn as you go. I already have a teaching business: should I buy this course? It depends. If you’re happy with your schedule, then it might not be necessary (although it will definitely help you take your teaching business to the next level and show you how to earn more). But if you’re struggling to get learners or want to expand, then it will be perfect for you. What if I want to expand and do more than one-to-one lessons? A theme running through this course is that you can take things as far as you want to take them. I include 3 video lessons that look at how you can earn extra income on top of your one-to-one lessons. Can I apply this course to any type of English teaching? Or any subject? Yes! 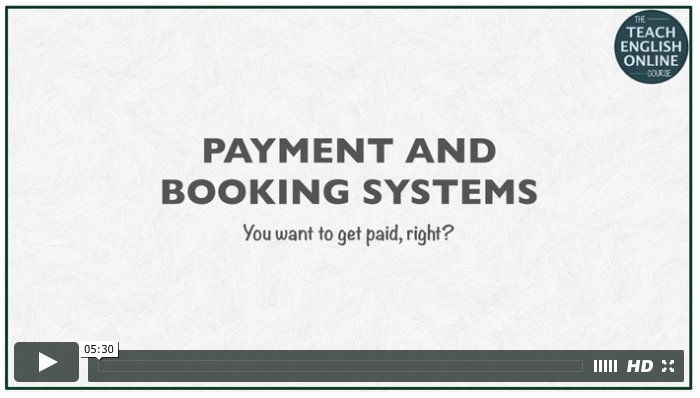 There are five videos that talk about specializing in a specific area. You can take this course to teach general English, exam English, English to young learners, or whatever area you want to specialize in. I wrote it so that it can be adapted for any language or any subject. Can I get feedback and support from you? Definitely! As I receive questions inside the course I will be constantly adding more information and resource videos along with building the Q&A section. Additionally, there is one-to-one mentoring available for those who buy the complete package. What if I Need to Know More? If you have other questions, then get in touch with me using the contact form below. I will respond within 24 hours (sometimes slower on the weekends). "Jack's course is perfect for ESL teachers who want to get started teaching online quickly without wasting time. I wish such a course had been available when I started teaching online!" "Jack's comprehensive online course will have you up and running your own online school in no time. His videos cover every aspect of the business of teaching online, and he highlights the most important points at the end of each lesson. If you're serious about firing your boss and working for yourself, or if you just want to supplement your income by teaching online, you have to sign up!" The progress I've made towards becoming a full time online English teacher in such a short time is incredible. I have to say without the guidance I've received from this course, I'm not sure where I'd be. I know that because of it, I have avoided a lot of pitfalls and have been put on the right path to success. A big thanks to Jack for all the effort he's put into creating this very valuable course! Jack's material for Teaching English online has been instrumental on my path to building an online language school. Because I applied his easy-to-follow methods, I now generate enough revenue to support my world travels - and it only took 8 months! If you want to take control of your income, leverage the internet for location independence, and be at the forefront of a burgeoning industry, then you MUST take the 'Teach English Online Course'. I have finished your course and although it took me some time, between balancing my in-home English teaching business and life in general, I am thrilled to have completed the TEOC. I learned so much valuable information that would have taken me years to learn had I done this all on my own. Surely, it'll still take time to see what works and what doesn't for me, but at least I'm not going into the online English teaching world blindly. You're a real class act for being so helpful in a field where some may look at another online teacher as competition. I'm also grateful that once the course is purchased (and even finished), I can return whenever I need and use the information as a life-long resource. "Just wanted to say I'm making my way through your course and I have to say I'm really enjoying it, well worth the investment. It has been just what I've been looking for clarity and direction. First student booked in for Sunday, really excited." "I am so glad that Jack created this course. It is just what I needed." "No one guides and supports online teachers quite like Jack Askew does. And now he's created a spectacular course to help you get started in this fast-growing field of our profession. Run don't walk to sign up!" I decided to take The Teaching English Online Course because I felt I needed guidance on how to create a online English teaching business. I am about to launch my website soon thanks to Jack´s step by step approach in the course, his explanations have been crystal clear and achievable. Jack has been a fantastic support and has replied to my emails within 12 hours with really helpful tips. The fun and games start now with the marketing of my website, but I know I’m not alone because I know I have Jack´s continuous support whenever needed. Jack's course is great! 🙂 It gave me a lot of great ideas for starting an online business and improving my delivery of online lessons. I really loved the Facebook group that he created for networking with other online teachers. I made so many great contacts there. "As an online teacher who loves what he does, I highly recommend Jack’s course to anyone considering teaching online. Jack provides plenty of valuable information that flows logically and at the correct pace. The course answers the questions which people ought to address before moving online, and obviously Jack offers a lot more information that you won’t be aware of yet. I especially like the Finding a Niche section of the course. When I first began online teaching, I ventured alone and so thought I would teach English to everyone and anyone… I lost an enormous amount of time and created a workload that I couldn’t manage. Finding a Niche provides invaluable advice that doubles as hindsight, as does the section on Getting Set Up. I’m really pleased to see such a professional course to help teachers move online. For me, it was a career move that gave me back control of my skills, my time and my student relationships. It also made my profession rewarding again. If you’re thinking about online teaching, this course is worth your time." Jack's TEOC course is worth every single penny I paid for it. I've purchased many online courses and Jack's is professional, concise and filled with useful information. I'm now part of a community where I can see what others are doing that's working for them. Although I went into a different field, I have used what I learned in my current online work and refer back to the course or Facebook forum all the time. I highly recommend this course! CASOC has been everything I wished for, and more. I learned everything I needed to sell the courses I already have online - which is exactly what I am doing now! Recommend it highly. "I took the course in September and I have very very good news... I have a new website and I'm already working full-time online (after 3-4 weeks)! Online teaching has completely changed my life and it is the first time that I really enjoy teaching! It has all happened so fast and I still can't believe it!" The course has focussed me on finding a niche, and as a result I have hit some important financial and personal milestones. I come from an RAF family - my father was one of the first six link instructors in the UK - and as a journalist I specialised in writing about flight simulation. Also, I am an Accelerated Learning trainer, a Master NLP Coach, an Advanced Reading Instructor and CELTA qualified. When I started putting all these skills together to teach a senior airline pilot, we struck gold. He was the only one of 100 pilots tested last month to be given level 6 in his aviation English exam (EALTS). I also helped him secure his dream job for a Saudi Airline on an amazing package. He is championing me to colleagues with similar aspirations, and so now I am teaching a handful of pilots, all by referral. I couldn't be happier about this. My business strapline is 'English skills for your dream life' because my clients are big dreamers, just like me - and they are using English to create their patch of heaven. My advice is to do Jack's course, be brave in reaching for your dream, and make sure you are doing what you do best. Together, these three things are a powerful combination. "I'd been following Jack's blog for teaching for almost a year now, and when the Teach English Online Course came out, I was so excited to learn even more about starting a teaching business online. While his blog gives some great tips, the TEOC course really goes into detail and lays out the why-what-hows of teaching online. It was great to be guided by each of the videos and know that I was following in the steps of someone who had already been successful. One of the most valuable parts of the course has been personal mentoring with Jack. His advice about website design, how to get students for me personally, and networking have been indispensable. Going from working for someone else to working for yourself can be daunting and full of so many life changes, but talking with Jack has eased my mind incredibly. Even though he has been a successful online English teacher and now is at the forefront of teaching other teachers, his advice and attitude are so down-to-earth. While the course itself is definitely worth the time, I highly recommend mentoring as well. Thanks, Jack, for helping guide me from having zero students to having a full week's schedule! I'm excited about my new career path and the flexibility that it gives me." You can get access to all of this for just 12 payments of $59 (or save $111 by paying in full)! Whichever plan you choose, you will get instant access to everything. 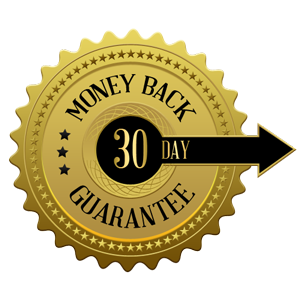 There is a full 30-day money back guarantee: if you don’t think this course offers amazing value, then let us know and you’ll get a full refund (see our refund policy for full details). This means that there is no risk. Whichever option you decide to choose, you get instant access to EVERYTHING inside the course. And, with a 30-day money back guarantee, you can try the course risk-free! I’m seeing more teachers take control of their teaching and income by moving online. I would love for you to do the same. So, choose the option that suits you, enter your details, and you will be inside the course immediately. I look forward to helping you build a successful online teaching business.